The quoted verse from the Gospel (Good News) of Luke is part of the larger teaching by Jesus commonly referred to as the “Sermon on the Plain” (or Sermon on the Mount). Jesus teaches about blessings and woes. Followed by teaching on love and mercy. Jesus teaches to love our enemies, do good to those who hate us, pray for those who mistreat us, turn the other cheek to one who strikes us, offer additional clothing to someone who takes our coat, give to everyone who asks and do not demand back something taken from us. Jesus explains anyone can do good to people they love, even sinners lend to sinners. If you love your enemies and do good to them expecting nothing back your reward will be great and you will be children of the Most High. We should be merciful as our Father is merciful. Then we hear stop judging and you will not be judged, stop condemning and you will not be condemned, forgive and you will be forgiven. Whatever you give will be given you. It is a little like golden rule, do unto others as you would have them do unto you. Jesus instruction is the opposite of what we might think is natural culturally. Jesus turns what seems natural upside down, creating a world where caring is greater than individual success. This is our mandate, to love, give, be free of judging, forgive easily, and never condemn others. This is obviously what it is like where Jesus came from. Those with the most need are served and those with the most give their stuff away. We must practice this now or when we get to where Jesus lives we won’ be comfortable. Who is your enemy? 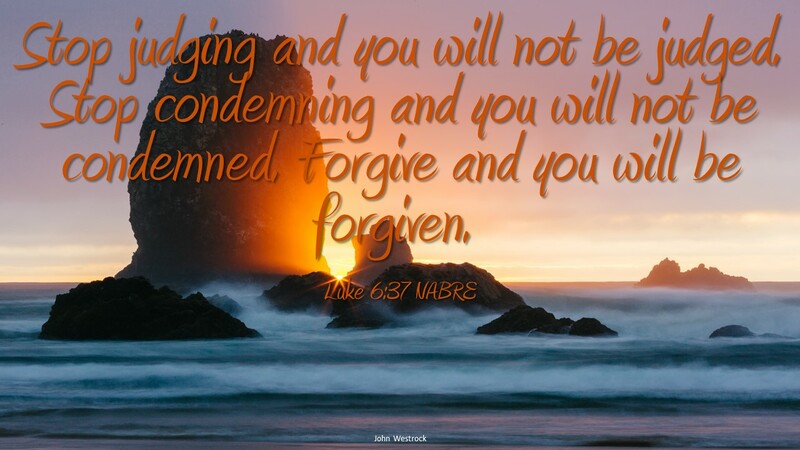 Can you stop judging and condemning and start forgiving?